Manhattan Scientifics Inc., a nanomedicine technology transfer and commercialization pioneer, today announced completion of its agreement to acquire all commercial rights to the body of work of nuclear physicist Edward R. Flynn, PhD and his company, Senior Scientific LLC. New Jersey's Public Service Electric and Gas Company is soliciting proposals for energy efficiency technology demonstration projects. The Supervisory Council of RUSNANO approved the project for reconstruction and expansion of production of a paving asphalt modifier Unirem, developed and manufactured by Novy Kauchuk. The integration of new Viscotek product pages within the Malvern website highlights how gel permeation chromatography/size exclusion chromatography (GPC/SEC) technology enhances the company's ability to deliver insightful, information-rich material characterization solutions for the broadest range of industries. IonSense, Inc. has announced the availability of the 3+D Scanner for rapid chemical analysis of surfaces. One system was purchased by a new customer for the development of next generation advanced high-k metal gates, while the second is a repeat order from an existing customer planning to use Pulsar in its 32 nm high-k manufacturing ramp. Both tools include multiple Pulsar high-k reactors. Concentrix Solar, a leading supplier of Concentrator Photovoltaic (CPV) systems and a new division of the Soitec Group (Euronext Paris), the world's leading supplier of engineered substrates, announced today that it has signed a contract with Chevron Technology Ventures for the deployment of a one megawatt (MW) CPV power plant to be installed at a Chevron Mining facility in Questa, New Mexico, USA. 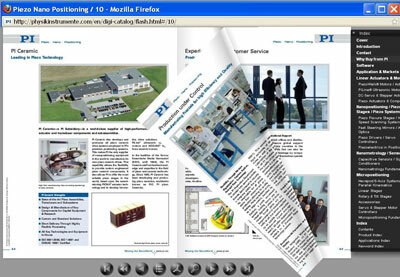 The 560 page digital publication also contains extensive tutorials on piezo motion technology, the fundamentals of nanopositioning, micropositioning and nanometrology. This project to manufacture innovative drugs combating age-related diseases is based on pioneering work by V.P. Skulachev, member of the Russian Academy of Sciences and director of the A.N. Belozersky Research Institute of Physico-Chemical Biology. Altera Corporation today announced it is shipping in volume production the first members of its 40-nm Arria II GX FPGA family. With immediate effect, the Carl Zeiss AG Supervisory Board has elected Dr. Theo Spettmann as the new Chairman of the Supervisory Board. ALLVIA, the first through-silicon via (TSV) foundry, has integrated embedded capacitors on Silicon Interposers, a key interface between a silicon device and an organic substrate needed for managing high interconnect densities. Samsung Electronics Co., Ltd. announced today that it has begun mass producing the industry's first low-power four gigabit DDR3 devices using 40 nanometer class process technology. The TEL team will work alongside SEMATECH engineers at CNSE's Albany NanoTech Complex to advance extreme ultraviolet lithography (EUVL) and related infrastructure - including mask defect reduction, mask metrology, source, resist processing, etch, and overall manufacturability and extensibility of the technology. The eBeam Initiative, a forum dedicated to the education and promotion of a new design-to-manufacturing approach known as design for e-beam (DFEB), today announced that six additional companies spanning the entire semiconductor value chain have joined the Initiative to support the new DFEB mask roadmap for high-volume applications. D2S, an emerging design and software company, today announced its new design for e-beam (DFEB) mask technology for the production of advanced optical photomasks with circular and curvilinear shapes.